Ray Harryhausen's body of work is a wonderful collection of fantasy and science fiction films in which his imaginative special effects are really the movies' star. Few would argue that his greatest achievement was 1963's "Jason and the Argonauts," the movie version of the Golden Fleece myth. Produced by longtime partner Charles H. Schneer, written by Jan Read and Beverly Cross, and directed by Don Chaffey, Harryhausen's menagerie of fabulous creatures are in top form. The film stars Todd Armstrong as Jason, with Nancy Kovack as the love interest Medea in what's essentially a fairly small (though important) supporting role. Fine support is also given by Honor Blackman as the Goddess Hera, Laurence Naismith as Argus, and Nigel Green as the mighty Hercules. The concept of the Greek Gods meddling in human affairs from high atop Mount Olympus would be repeated in 1981's "Clash of the Titans" (the myth of Perseus and Andromeda) and despite the star studded cast of the latter film (Laurence Olivier made a terrific Zeus), the "Jason" cast still does it best. But Harryhausen movies aren't about actors, directors, and screenwriters (well, okay, the script's a big deal); they're about Ray Harryhausen's special effects, and the master was certainly busy on Jason. We're treated to the colossus Talos, the seven-headed Hydra, an army of skeletons, and a group of Harpies, all of which are realized lovingly. Sure, they can't be real, but that's the charm of Harryhausen. While other movies were using actors in costumes for their monsters (and Ray does that here, with the God Triton), Harryhausen's stop-motion "Dynarama" monsters were different because it was obvious they couldn't possibly have been actors. Jason positively shines with imagination and with Harryhausen's meticulous craftsmanship - and nowhere has this classic fantasy been seen better than in the high definition quality of this Sony Pictures Home Entertainment Blu-ray release. To get an idea about how hard it was to do what they can now do much more easily (and, alas, convincingly) with computers, check out the interview that accompanies the "Jason" Blu-ray (and which was also on the earlier DVD release). It's conducted by director John Landis, who's so obviously a huge Harryhausen fan that most of the interview sees him gibbering in excitement about being in the presence of the master (I felt the same way when I met Mr. Harryhausen oh-so-briefly several years ago, where he autographed a movie poster for me). But here you'll learn how difficult it was for Harryhausen to keep track of, for example, seven Hydra heads moving in different directions - and how meticulous the construction of the model monsters was. There's also an interesting feature in which many of today's special effects movers and shakers pledge their devotion to Mr. Harryhausen, though after a while it gets to be a bit much. Better is the nearly hour-long documentary The Harryhausen Chronicles, hosted by Leonard Nimoy, which is an excellent look at Mr. Harryhausen's career from his early days in his parents' garage to his final film the original "Clash of the Titans." The Blu-ray is presented in 1080p widescreen at an aspect ratio of 1.66:1, which leaves small black bars to either side of the picture when projected on a 16x9 screen. The picture quality is clearly the best so far available on home video, but I'd have loved to see a complete, meticulous restoration. There arwe scenes here that look glorious, with rich color and a distinct lack of noise, but there's also a lot of grain - and not just in the special effects sequences, where you'd expect it. Still, it's better the best Jason yet. Perhaps strangely, the picture looked better on our 50 inch plasma than on our 106 LCD projection system. Go figure. Audio is dts-HD Master Audio and it's easily the best Jason soundtrack yet as well. It's better than you might expect from a movie that's nearly 50 years old, fairly dynamic - and they've even created some decent surround effects periodically. And Bernard Herrmann's terrific score sounds better than ever. There are two commentary tracks as well, both of which are worth your time. The first features Mr. Harryhausen himself along with film historian Tony Dalton and the second features legendary director Peter Jackson accompanied by special effects guru Randall William Cook. In a bit of irony, the technican at one point notes how intelligent the screenplay is - that the movie is more than special effects - while the Oscar-winning "Lord of the Rings" storyteller responds that (like me!) when he was a kid he just wanted the film to get to the next special effects scene! 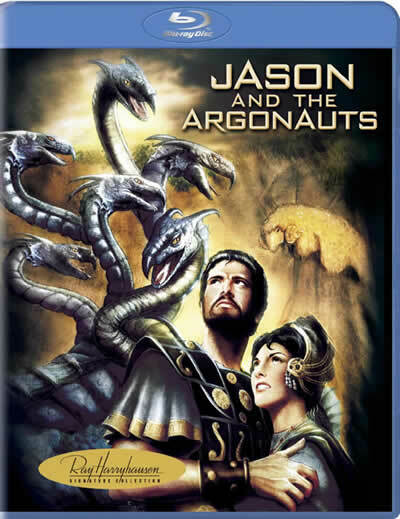 Despite its flaws, this is easily the best video version yet of "Jason and the Argonauts," and a legitimate collectible for Harryhausen's millions of fans. The 7th Voyage of Sinbad was Harryhausen's first color feature, which made it a groundbreaking film in the annals of cinefantastique. As straightforward an action/fantasy film as a Harryhausen movie can be, it stars Kerwin Matthews in the title role, with Kathryn Grant as the girl/princess/requisite love interest. The story follows Sinbad on his usual quest (this time to the Island of Colossus - a couple of times) where he meets and faces an evil magician, a genie in a lamp, and a terrific variety of Harryhausen's trademark critters, from two headed Rocs and giant Cyclopses to a skeleton swordsman and a mean, firebreathing dragon. Harryhausen is in great form in this outing, as is Bernard Herrmann's musical score, and the Sony Blu-ray does the film justice; this is definitely the best video version yet. The picture quality, which the company says is from a new high definition transfer, looks good in its 1.66:1 widescreen (which leaves "keyholing" bars to the sides of the 16x9 picture) glory. Alas, the 1080p picture is full of grain, especially (and not surprisingly) during the effects scenes. We'd love to see a complete restoration, but such isn't the case. That said, there are times here when the picture displays that lovely depth we've grown to love so much with Blu-ray discs and it comes through even with the grain. The audio has also been remastered and sounds as good as it can, with dialogue coming from the center front channel and the music mixed to the main front channels. The music in particular sounds great in this Dolby TrueHD version. Harryhausen fans will love the extras on this disc. Not only do you get a repeat of the John Landis interview from the DVD, but there's an audio commentary with Ray Harryhausen, visual effects experts Phil Tippett and Randall William Cook, author Steven Smith, and Arnold Kunert and what appears to be a new feature "Remembering 7th Voyage of Sinbad" featuring Mr. Harryhausen himself, with his insights. There's also a short featurette promoting the film's "Dynamation" stop motion animation technique, "The Legacy of Ray Harryhausen" featurette, a tribute to Bernard Herrmann, a photo gallery and some trailers and a Blu-ray disc featurette. 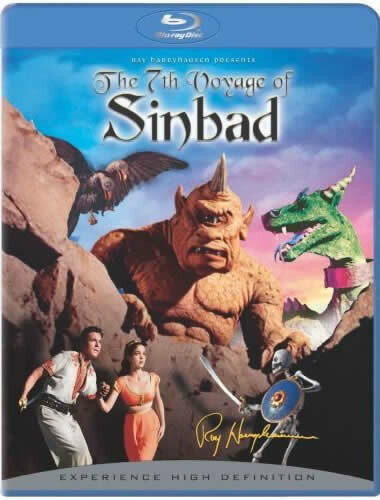 This is the best video incarnation of 7th Voyage of Sinbad that we've seen and is a fitting way for this groundbraking fantasy film to be seen - and owned.